Coming off her summer movie, Mamma Mia 2 – Here We Go Again, she’s co-producing The Cher Show Broadway musical that opens in December and she’s got a new album dropping on September 28 called Dancing Queen, which is her tribute to the music of ABBA. On top of all that, the 72-year-old actress, musician and producer has found time to go back out on tour. 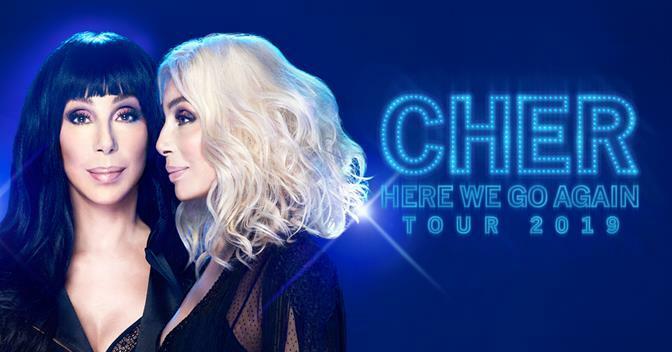 She’ll be bringing her nationwide Here We Go Again Tour to the Jacksonville Veterans Memorial Arena on January 23, 2019 with ticket sales to the general public starting on Friday, September 14 at 10 a.m.
Cher has reinvented herself many times in the past and famously said “farewell” only to come back again. She toured for three years from 2002 to 2005 – including a Jacksonville performance - for what was then called the Living Proof: Farewell Tour. Cher also performed at the Veterans Memorial Arena in 2014 for her Dressed To Kill concert. Although a set list hasn’t been released for her upcoming nationwide tour, her promoter says fans can look for new music from her Dancing Queen album to be included along with her hits. For a look at some of the other songs fans may hear, here’s the setlist from her 2014 performance at the Jacksonville Veterans Memorial Arena.